We've just embarked on an mission to tart up our garden for the summer. It's a mission with a strict and small budget. I wanted something that the kids could contribute beyond throwing soil around, so we came up with the plan to let them make their own stepping stones. We picked up a small bag of quick setting concrete from Lowes and a couple of bags of those flower arranging glass nuggets from the Dollar Tree. 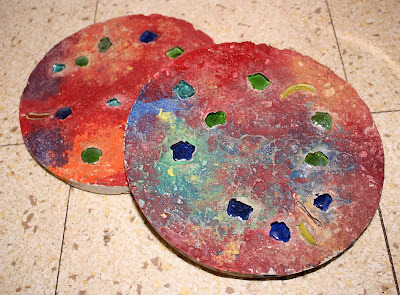 We mixed up a batch of the concrete, sprayed the inside of a plastic plant pot saucer with Pam cooking spray and plopped it full of concrete. Then we let the kids squish the colourful glass nuggets into the top of it and let it set in the sun. 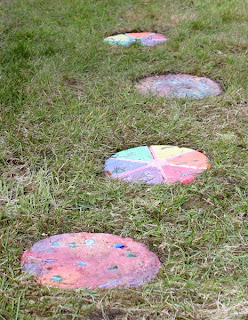 When they were dry the kids went at them with cheap kiddy paint that we had about the house anyway and I varnished the painted stones for a bit of extra durability and plonked them in the garden as a little path for them to hop about on. A few days later we did some more with cement rather than concrete so they could make hand prints in a few. I'll post pics of those up when they are finished. I love the paint, now I want to make more for our yard! !